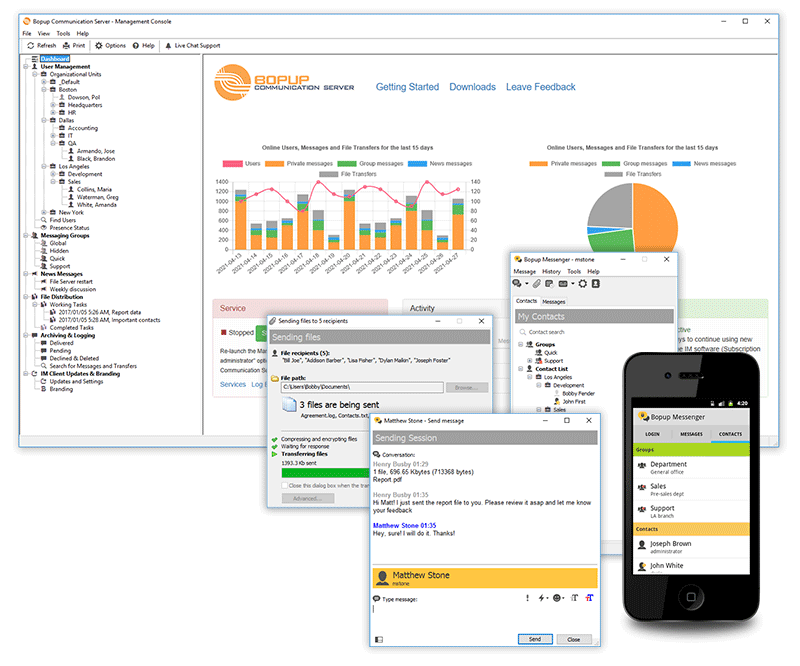 Bopup IM Suite Office Pack is a secure client/server instant messaging system designed to provide efficient, internal and private communication over networks of any size. It meets most of the critical business and enterprise needs, such as centralized management, the Active Directory (LDAP) support, message and file transfer logging and can be easily deployed over the business infrastructure to unite the entire company's offices and other locations into one internal IM workspace with control over messaging groups, user permissions to view others and send messages and documents, message and transfer archives with printing support. This software bundle includes a license for Bopup Communication Server (IM server) + 50 instant messengers. Since the IM server stores and delivers offline messages and files, users never lose information they are supposed to receive. Messaging is encrypted with strong algorithms so personal and group conversations are safe and secure even if data is sent via the Internet. Users can send messages with formatted text, links and graphic emoticons (smileys), organize their personal Contact Lists, access their contacts from any workplace and see who is online and available for communication. The client software can be configured on the server to run in the Confirmation Mode, which means that the client pops up every time a new message is received and keeps the window on top until the user confirms the message. To crown it all, the server-side software is fast to deploy and easy to use. It has a great and flexible user interface and comes with a built-in messaging system for scheduled and planned user notifications including the File Distribution system that offers a managed distributing documents to users. Client instant messengers can be easily installed and distributed via Group Policies with the support of pre-installed settings. Changes: The server added localization to Russian language. The server console speed up showing data in Message History. Management Console checks and registers IM service module if it is missing. Fixed issues with upgrade previous versions. Many other improvements and minor fixes. Тверь, Россия, 24 октября 2016 — Компания «Би Лабс» (B Labs), разработчик корпоративных решений в области коммуникаций в реальном времени, сообщает о 60% снижении цен на программные продукты Bopup для обмена мгновенными сообщениями. Bopup IM Suite Office Pack unregistered trial version, may be freely distributed, with exceptions noted below, provided the distribution package is not modified. No person or company may charge a fee for the distribution of Bopup IM Suite Office Pack without written permission from the copyright holder. Both server-side (IM server) and client-side software (Bopup Messenger, Bopup Observer) unregistered trial version may not be bundled or distributed with any other package without written permission of the copyright holder. LICENSE FOR USE AND DISTRIBUTION Bopup Communication Server, Bopup Messenger, Bopup Observer are distributed as try-before-you-buy products. This means: 1. All copyrights to Bopup Communication Server, Bopup Messenger, Bopup Observer are exclusively owned by B Labs. 2. Anyone may use this software during a test period of 30 days.